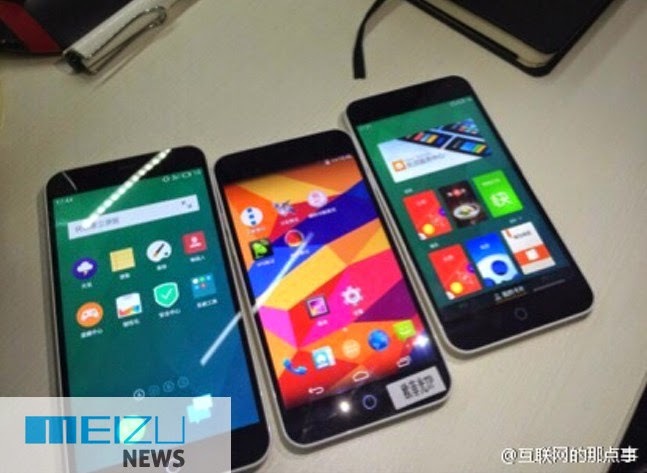 Meizu M1 Specs and Actual Photos, Leaked! 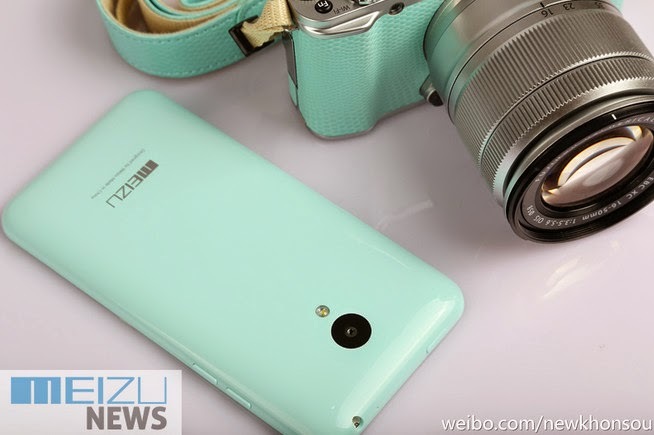 "Mark, everyone's calling it 'Meizu M1 Mini' but really, it's going to be called simply Meizu M1. They'll have two entry-level models this year: The 4.7 inch M1 and the 5.5 inch M1 Note. M1 will be the regular smartphone model and M1 Note will be the phablet -- both will be very affordable, especially the smaller device." That's what one of my trusted sources about smartphones from major Chinese brands told me during our casual conversation over coffee last week. He's been almost 100% accurate in every 'unofficial' or leaked information he's shared with me thus far so I have little reason to doubt his most recent disclosure. Meizu M1 Note and two units of Meizu M1, respectively. Besides these supposed photos of the upcoming pocket-friendly release - the freshest of which (first image in this post) was leaked by Meizu Vice President Li Nan himself on Weibo - suggest that regular smartphone variant is indeed a tad too big to called a 'mini'. Add to that this spy shot of what appears to be a GFXBench specs sheet of Meizu's 2015 4.7-inch (1280 x 768 pixels) smartphone that clearly calls it 'Meizu M1' with no 'mini' suffix. 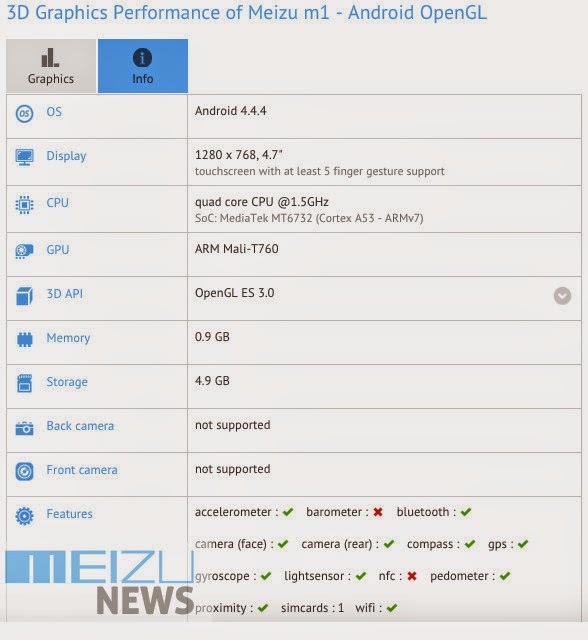 Interestingly, this screen capture also gives us more information about this model's hardware including its Android 4.4.4 KitKat operating system (that will be the foundation underneath Meizu's Flyme OS interface, which I find very neat and handsome), 64-bit MediaTek MT6732 SoC that incorporates for ARM Cortex A53 cores and a Mali T760 GPU, 1 GB of RAM, and around 5 GB of user available internal storage (most likely out of a total of 8 GB). As for sensors and connectivity options, based on this image, it appears M1 will support WiFi, Bluetooth, and 4G (via MT6732 chipset) and will come replete with GPS and Pedometer as well as Digital Compass, Gyroscope, Proximity, and Light sensors. How much will it be and when is it arriving locally? Meizu is expected to formally introduce Meizu M1 within the next few days and to release it in China sometime this Q1 2015. Novo7Tech, the official and sole distributor of Meizu smartphones in the Philippines, has made a promise to bring to Pinas all the best handset models by the brands they carry so I guess we should start to see the M1 and the M1 Note in their product catalog real soon. As for the local retail price, I believe Meizu M1 might come in at around Php 7,000 to Php 8,000; Hopefully, it will be a whole lot cheaper though.